Hang on to the summer with a little taste of Caribbean sweetness! Raw, vegan and a lot of fun to make, see how long they’ll last in the fridge! Place all the ingredients in your food processor (except the extra 1/3 cup of coconut) and pulse into well combined. You will know the mixture is ready when it congeals together and almost forms a ball. 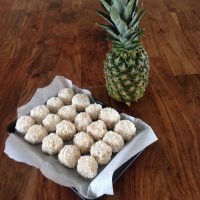 Roll the mixture into small balls and roll in shredded coconut. Freeze on a baking tray lined with parchment paper for about 20 minutes. Makes about 30 depending on how large you like your balls!